Free professional training from Beacon Athletics. Welcome to Groundskeeper University. 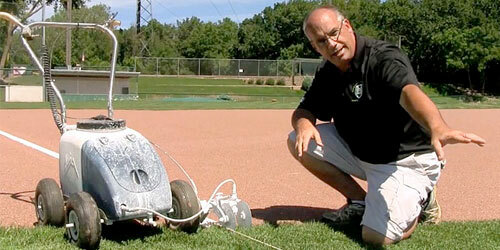 You’re about to begin learning using the premier online field maintenance training tool available. The best part? It’s FREE. Really! Our goal is to bring professional training directly to you and your staff. But that means things need to be done right. That’s why we developed Groundskeeper U from Beacon Athletics. We know everyone learns in different ways, so through written, audio, photograph, and video instruction, you’ll learn the tried & true practices of Paul Zwaska, former head groundskeeper for the Baltimore Orioles. You are free to browse the lessons as you like, come and go, brush up on what you need or go through all the modules start to finish. When you complete all 8 modules and pass the Final Exam you will become certified, and that’s how you can actually prove that you know what you are doing. To get going, just click the “Begin Lessons” button below to review the modules and lessons. Or, learn more about getting certified and how to track your progress as you go. Again, welcome and good luck! Watch the Phantom's 5-min setup! Learn how you can maximize your experience at Groundskeeper U.